Juicy, smoky grilled chicken breasts with a hint of sweet from the orange juice and savory from the sesame. Along with cole slaw bursting with different asian flavors…yum-ilicious! And while I may have gone a smidge over my $5 mark…we have plenty of slices of grilled orange sesame chicken for the kids to have for lunch tomorrow…and if enough, I’ll put some on a sandwich! 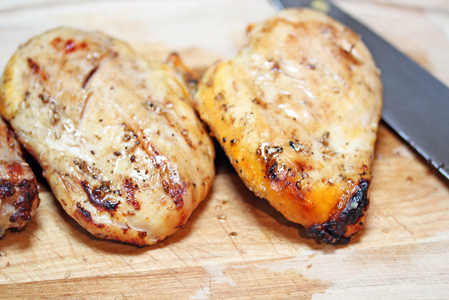 Place the chicken breasts in a shallow dish or resealable plastic baggie. Add the orange juice and toasted sesame seeds. (To toast sesame seeds, add them to a hot skillet and toast for 30 seconds to minute, shaking the skillet so they don’t burn.) Let sit in the refrigerator at least 2 hours, overnight, ideally. Grill the chicken breasts. Slice into thin strips, once cool enough to handle. In a small mixing bowl, whisk together the mayo, soy sauce, sesame oil, peanut butter, ginger with a couple dashes of pepper. Pour over the cole slaw in a larger mixing bowl and toss well. Assemble the wraps by adding some Asian Cole slaw and sliced grilled chicken. Roll and eat. 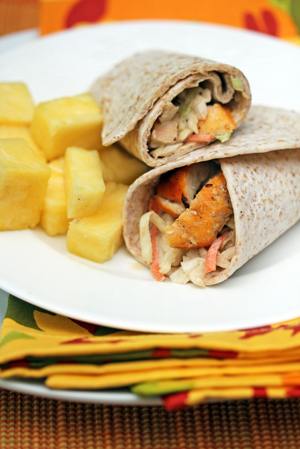 Serve Grilled Orange Sesame Chicken Wraps with Asian Cole Slaw with Pineapple, or other fresh fruit.